It's time to prepare for fall co-op, and I'm going to spend five days sharing ideas for creative classes! When we decided to turn our little Five in a Row co-op into something different, a place with class options and multiple classes in one morning, we knew a few things. We wanted to keep it small. We didn't want it to be schooly. We wanted to offer enrichment type classes. Am I passionate about the subject matter? Will my enthusiasm spark or stir something in the kids? This is why I chose to teach Into the Wardrobe. I love literature, and I especially enjoy The Chronicles of Narnia! I also love Creative Writing, and I could not WAIT to teach that class. If you aren't excited, your students probably won't be either. Is this class easily taught at home? 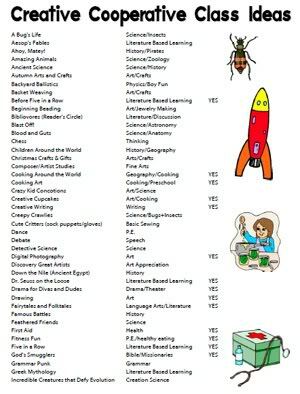 I try to choose classes that moms don't want to teach at home. A class like Let's Make a Mess is a big hit with preschoolers, but who wants to do all that at home? Another fun (but messy) co-op class is Cooking Art. What's the benefit to teaching this class in a group setting? LEGO Building Club included a Show and Tell portion in which the children had the opportunity to stand up and present each week. In Think! Team Building Challenge, the students had to use teamwork to complete the tasks. With those considerations in mind, I compiled a list of classes to help moms in my co-op brainstorm as we were choosing classes to teach. It's not a master list, but it is a good start! You can click on the image below to download the list. I'm going to spend the next four days focusing on four specific classes. I'll share the overview, the syllabus, and other fun information in case you'd like to use the class in your own cooperative. You can find other classes I've shared on the Co-op Classes page. Don't miss a single post in the Creative Co-op Classes Series. 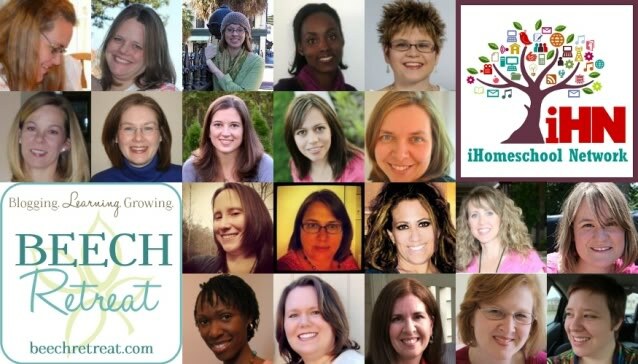 This 5 Days Series is organized by the iHomeschool Network, a collaboration of fabulous homeschooling bloggers. Click the image below to find links to all the 5 Days Series. You'll be inspired to declutter, to get ready for the return of the routine, and to use your slow cooker more often (off to read that right now!). This is such a great resource! Thank you so much for sharing it. I would love to see the plans for “God’s Smugglers”, “Monkeys on the Move”, “Weather Wonders”, and “Watercolors”. If you don’t want to post all those, but can email them to me, that would be fabulous, too. Thank you SO much! What a great list! I’d love more details about the cooking classes (cooking around the world, creative cupcakes, what’s for breakfast) and God’s smugglers. Just wanted to say thanks for this list ami, what perfect time since our little co-op meets this wednesday evening for some planning time! Also, we loved your creative writing class-the girls have excellent stories and poems to treasure and it was very easy to follow-but full of such RICH lessons. We only made it through week 3 or 4 before the year ended so we plan to pick it back up this fall. I’m planning a theater class for our co-op this fall so once I’ve gone through that process and tried it out I’ll post those plans on my blog. We just started a homeschool co-op and I have to teach a class!! AHHH 🙂 It’s not like I am a new homeschooler, we are on our 13th year. But I know that I have to have a lesson plan, then I could deviate from it if I want, but I HAVE to have that step by step plan. So I was searching for some plans and came across your blog! Bless you!!!! I like the building thinking challenge plan. But I saw this post and would like to maybe do something with literature too. Can you please share your plans? I would love to say share all of them and I could read through and pick one or two to do. Would that be too much? Any help would be appreciated!!! !